"Using an LED array and some reflective tape, you can use the infrared camera in the Wii remote to track objects, like your fingers, in 2D space." "Since the Wiimote can track sources of infrared (IR) light, you can track pens that have an IR led in the tip. 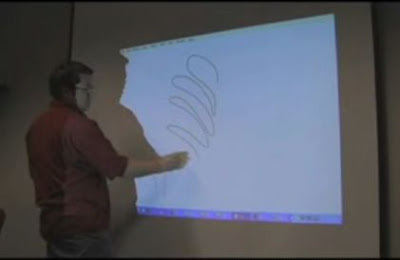 By pointing a wiimote at a projection screen or LCD display, you can create very low-cost interactive whiteboards or tablet displays. Since the Wiimote can track upto 4 points, multiple pens can be used."